I've loved Snoopy ever since I was a kid, and I have a small collection of Snoopy memorabilia, including dolls, action figures, ornaments, books and even an uncut sheet of trading cards. 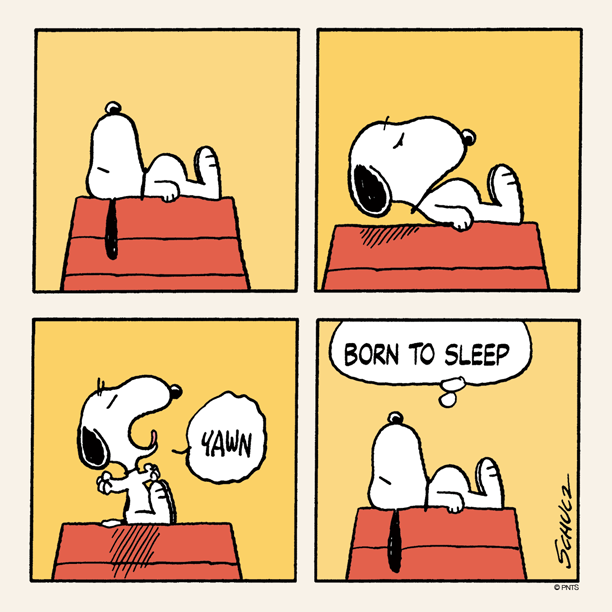 But I admit, I'd never really seen how Snoopy is a beagle. He certainly doesn't look like one. But I made the same mistake many people make -- I went by looks alone. We first got an inkling about Snoopy's breed in 1960. In one strip, Charlie Brown makes a comment which leads Snoopy to retort "I ain't no stupid beagle." So, I had a good long think, and after perusing the web for some comics, I've come up with 5 ways to tell Snoopy is a beagle! All of the following are courtesy of Peanuts Worldwide LLC. 1) He can tell when there's food on the way just by listening. Lulu can hear me open the fridge to get something out from across the apartment. 2) He is imaginative in play. Lulu comes up with her own games when I'm not there. 3) His vocalizations are loud and proud! Yeah this is self-explanatory for anyone who knows beagles. 4) He's a philosophical dog. Beagles are very soulful. Anyone who has ever looked into a beagle's eyes knows they are deep and sad and beautiful. There is so much in a beagle's eyes. 5) And.. while they are very active, beagles also love to be lazy. 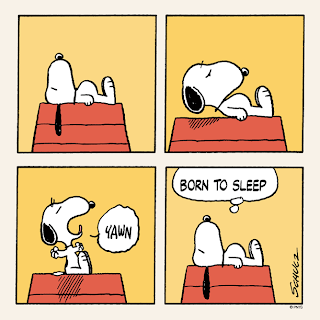 And so does Snoopy. As for how Snoopy looks... believe it or not white beagles are possible. And besides, the colors are so basic in the comic strip. 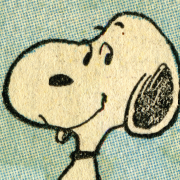 Can you originally imagine Snoopy looking like anything else? What do you think? How else can you tell that Snoopy is a beagle? I am a snoopy fan too! 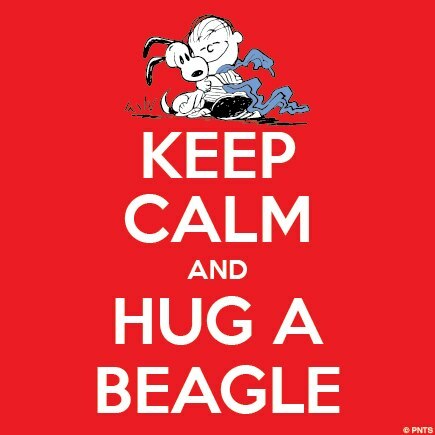 We're total beagle fans! Another trait is how Snoopy likes to wander off and do his own thing. Maggie would love to that if she could. It's so interesting that Snoopy wasn't around for the beginning of Peanuts. I just cannot imagine Peanuts without him! Very cute! Having had a beagle as i was growing up, plus one with my hubs, I think there are a few other ways that Snoopy is a beagle: (1) That "vulture" look he does is VERY beagley. Especially when waiting to be fed. (2) There are some cartoons where he leaps out and grabs Charlie Brown around the ankles. Our beagle used to do the same thing! If we walked by, ignoring her, she'd reach out and grab your ankle! (3) All the beagles I've known (4 in our family) loved to lay up on the back of the sofa, instead of ON the sofa like a "normal" dog - just like Snoopy likes to lay up on top of his dog house, rather than in it. Funny - I've been meaning to do a post like this to say how I can see that our current mix is definitely 1/2 beagle! Love your point about the imaginative games. Our beagle used to make up really fun games. She was a nut. This is a great post - I love Snoopy too, and I love the similarities you picked out. I thought of a couple things that Jackie also said...our beagle Cricket can definitely do that "vulture" look - I've seen her sit on the edge of the bed and called it her Snoopy look! She also loves to lay up on the back of the couch. Didn't Snoopy often carry around his empty food dish? Kobi would probably do that if we didn't put the dishes away! He has other ways of letting us know it's supper time though. I've got a black and white beagle as well, although she's got some cocker spaniel in her but still predominantly beagle, and oftentimes I compare her to Snoopy: lazy (especially during the day), always hungry after suppertime, either scratches the door or bumps it when she wants to come in (as opposed to kicking it), loves her blankets (and mine too), dances when she's excited (i.e. : whenever my dad gets home from work), and extremely vocal (as one meme once said on Facebook, she likes to "sing the song of her people"). She even likes to sleep on the back of the couch. Imagine if we had a doghouse in the backyard. You bet she'd sleep on top of it! Snoopy has the beagle face and ears !! Looks more like a bull terrier to me! Just wanted to share the beagles bakery with you, http://www.beaglesbakery.co.uk , we love beagles too! I never had a beagle, but my younger brother did. I went to college and came home and here was this beagle. The farm in the country is the perfect place for a beagle. I soon found out a beagle was a loyal dog but if he could go off on his own he was just as happy. I said You know, I think it is sad a dog can not walk like we can, or get a job and buy what he wants. My brother, 10 years younger said, Brother, I think he is perfectly happy being a beagle. I realized a beagle can take you or leave you, perfect. He isn't always pestering you for attention like the other breeds, absolutely perfect. Unless he howls that is. My brother had dumb names for dogs. Like the pointer bird dog, he named Lassie for example. Does anyone have a dog that has a name that doesn't quite seem to fit? We had a cat the grandkids named Elmer until she had kittens, oops! We still call her Elmer. We also have a dog named Sugar who comes to eat when we yell here kitty, kitty, kitty.